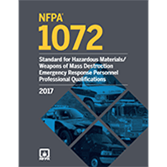 Help ensure first responder personnel are qualified for the challenges of Hazardous Materials/Weapons of Mass Destruction emergency response with the JPRs in new NFPA 1072. Challenges at the scene of a hazardous materials incident put people, responders, and the environment at critical risk. Protect communities and fire service and emergency first responder personnel with first-time NFPA 1072: Standard for Hazardous Materials/Weapons of Mass Destruction Emergency Response Personnel Professional Qualifications. This important new Standard identifies the minimum job performance requirements (JPRs) for Hazardous Materials/Weapons of Mass Destruction emergency response personnel. It's specifically designed for use in qualifying individuals through training and certification programs for responsibilities including response to and mitigation of hazardous materials and weapons of mass destruction (WMD) incidents. Essential for emergency responders, this Standard identifies the knowledge and skills necessary for today's response community. 3.4 Operations Level Responder Definitions. 5.6 Progress Evaluation and Reporting. 6.5 Evidence Preservation and Public Safety Sampling. 6.7 Detection, Monitoring, and Sampling. 6.8 Victim Rescue and Recovery. 6.9 Response to Illicit Laboratories. 7.5 Evaluating and Reporting Progress. 8.4 Implement the Incident Action Plan (IAP). 8.5 Evaluate Progress and Adjust IAP.